The seasons change with time. Your pond will display this to its fullest. Regardless of how cold or hot the winter is the plants know when its time to sleep. You will find most of your plants going dormant during the winter and fall season. Starting august you may notice yellowing and moderate wilting, often during this time flowers tend to lessen. 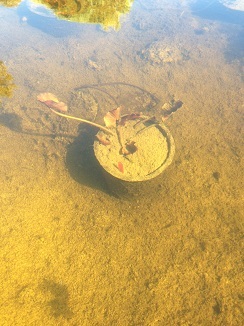 By the end of December or early January the pond should be in full dormancy. Many of the plants will look like they are dead. Rest assure they are just sleeping, the same way that the trees loose foliage, your aquatics will loose their foliage. Give them time and they will come back. You can expect a healthy and full plant by early May. Fertilizing your plants in April will hasten the waking process and give you flowers and foliage sooner. If you do not expect any frost, just leave everything in the pond and up to nature. The plants will appear to die back and go dormant (plant Water Hawthorne for winter blooms) and they will re-emerge next spring. If you do not expect to have more than 6" of ice on your pond, you can leave the plants in the pond PROVIDED THE ROOTS WILL BE BELOW THE ICE LINE. Tropical water lilies should be removed and stored. You can also make a temporary fiberglass cover for the pond and/or use a pond de-icer. If you expect to have more than 6" of ice or that the pond will freeze completely, then you should remove all of the plants for the winter. Remove the plant from its pot, wash and place in a pail of water. Change the water every week and allow the bulb to harden for one month. Remove the excess roots and foliage. Store the bulbs only in a small bag of moist sand. Double bag the bulbs, seal and label. Store in a dark location at 50 - 60 degrees. Build a frame of 2x4s to support the sheets of fiberglass. Make sure the cover stays on at night, even if the weather warms temporarily. Use a pond de-icer to keep the water at an even temperature. Plants protected by a cover over the winter and warmed with a de-icer will come to life earlier and faster in the spring.